Work has continued at a steady pace since our last update. We are approaching the final stages of our new Phase III at Tara Woods. Currently, the electric and cable conduits are being installed. 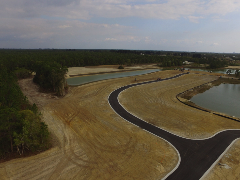 Roads are complete, and the first layer of asphalt has gone down. We still have some sod work to complete, but other than some minor details, we are ready for new homes. The first five homes started coming in on Tuesday, February 21, 2017. These will be the model homes. It is exciting to see all of this come together, and we’ll keep you posted on further developments as they occur.